The perfect shoe for transitioning seasons. If you were to examine your wardrobe, you would most likely find a surprisingly visible split between the clothes meant for the warm summer months and those designed for harsh winter weather. The number of layers and their intended function differs, of course, but there is a larger division between the seasons that lies under the surface. Many people tend to shift their personal style according to the local climate, which can fluctuate wildly. As a result, one’s wardrobe tends to take on a duality between two conflicting (or coordinated) styles, and this becomes especially pronounced during the shoulder seasons. Pick up a pair of Sebago Campsides on Amazon for $71. The most common combination of styles is a blend between Prep and Americana; they play off of each other’s weaknesses, so it’s an excellent choice for those seeking a sense of completion. 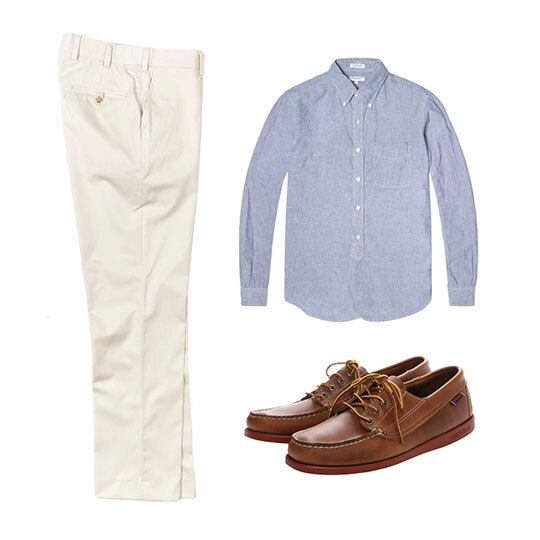 Prep (as many know it) has a keen focus on shorts, polos, and lightweight fabrics, so it works incredibly well during the summer. On the other hand, Americana concentrates on thick denim, hard-wearing boots, and high volumes of leather – although it’s certainly possible to wear it in the warmer months, it naturally works best with layering. One could almost say they are two sides of the same coin, given their deep histories in the USA. Regardless, most people adopt an amalgamation of both styles to serve them over a wide range of temperatures. Of course, housing such a wardrobe is no easy task. Blended styles will always require substantially more garments, so you might find your closet overflowing during the transitionary seasons. Few items of clothing are capable of bridging the gap between contrasting styles, but they do exist, and their sheer versatility will quickly make them the favorite pieces in your closet. Tops and bottoms tend to be somewhat interchangeable, but footwear is an entirely different beast: shoes are often intrinsically tied to a specific aesthetic, so swapping between styles and seasons can prove particularly difficult. The blucher moccasin, as its name implies, is an amalgamation of two entirely different types of shoes – perhaps this is why it straddles styles so well. 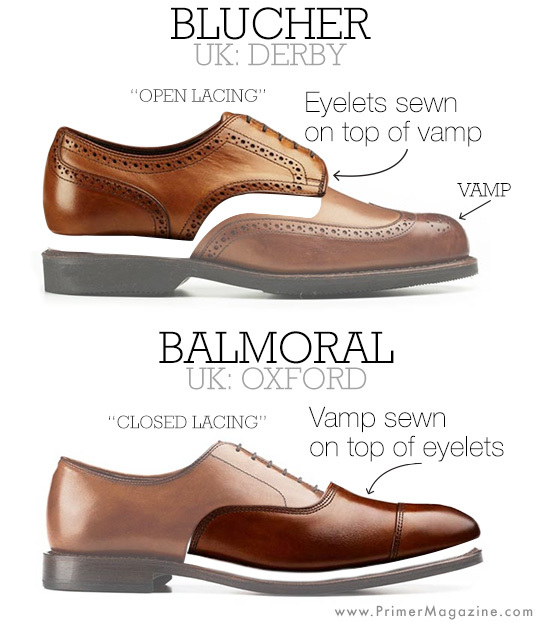 More specifically, the open lacing structure earns the shoe its delegation as a blucher versus an oxford. Furthermore, the stitching throughout the toe box connects the vamp to the quarter, which is a common feature in Native American moccasins. The end result of this remarkable fusion is incredible versatility, which is further exacerbated by its four-season capability. Blucher mocs are absolutely steeped in history, as well. Along with the camp moc, they were first released in 1936 by Leon Leanwood Bean (founder of L.L. Bean, as his name implies). 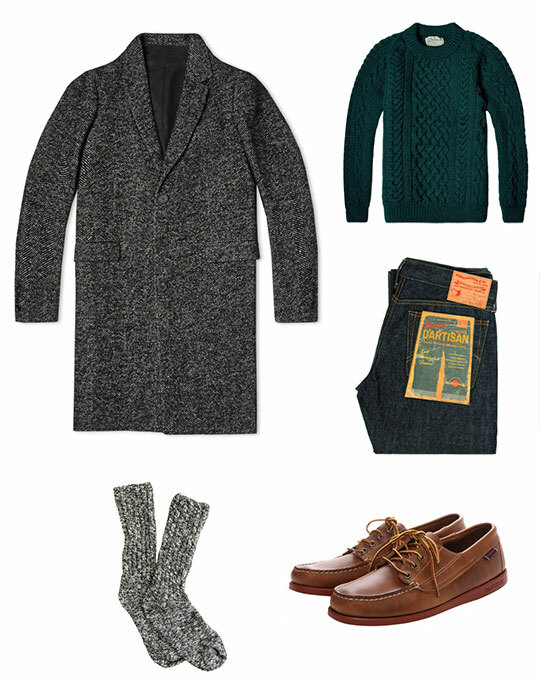 Both of these shoes were heavily inspired by moccasins, but built upon them in a way perfectly suited for the wet Maine climate. The major addition to both shoes was the quintessential pebbled camp sole – though traditionally charcoal, many modern variants have branched out to brick red, tan, and an assortment of other colors. This sole provided some degree of traction in wet conditions while maintaining comfort, and the use of a welt allowed it to be repaired at a moment’s notice. Although most blucher mocs on the market nowadays are cemented, some higher-end retailers still offer this feature, and you should seek it out when possible. This specific offering from Sebago sports an unlined, full-grain leather upper with a straight-stitched moc toe. It has four eyelets (though other blucher mocs might have anywhere from three to five), and retails with traditional orange nylon boot laces. I recommend switching them out with kangaroo or rawhide leather laces, but that’s up to you! The camp sole is a surprisingly bright brick red, which pairs well with the tan leather. Though not welted, it does feature fake stitching on the underside of the shoe. Internally, it houses a three-quarter length leather sockliner, which provides an adequate level of comfort. It does run slightly narrow, so I suggest wide-footed folk to try them on in-person. Ramblings on versatility are utterly useless without examples, so I threw together a mock-up outfit for each of the four seasons to demonstrate the blucher moc’s potential for year-round wear. If something is sold out or too expensive, just look around at different retailers – you should be able to find something similar! Also, remember that these are just examples: if you don’t like a particular piece, you’re more than welcome to switch it out. 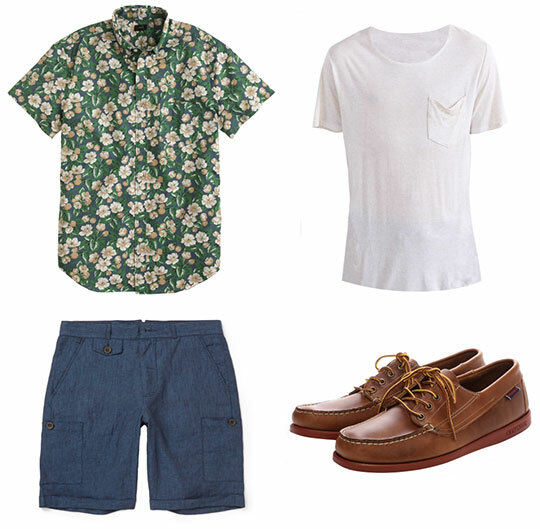 You can get similar versatility from he right boat shoes. My Sperry Makos look fine with socks and work year-round, since they’re in a neutral brown and have a more substantial sole and slightly higher vamp than most boat shoes. 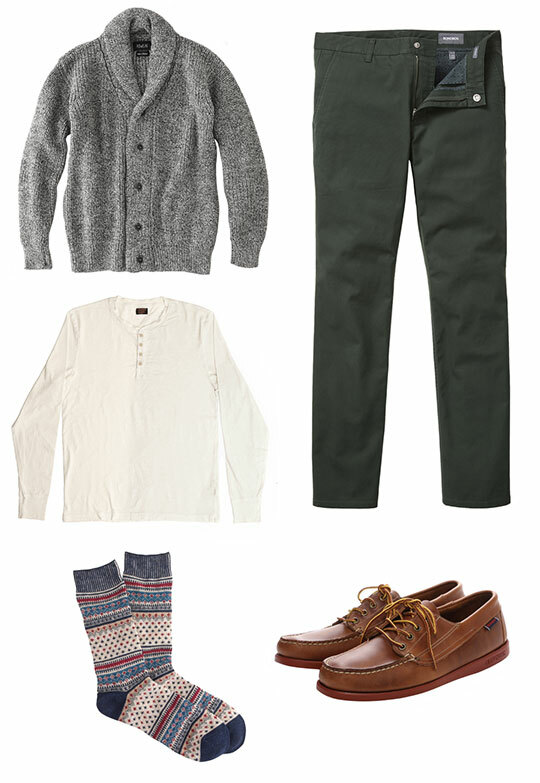 I feel weird wearing boat shoes with any other sock than no-shows so blucher mocs work best for me when I want a similar style but with socks. I did struggle to fight past the dogma forbidding the union of socks and boat shoes, but then I realized that 90% of the population wouldn’t even notice. Maybe half of the remaining 10% would judge me negatively for the combo, and I’m betting those aren’t people whose opinions I value. For me, I’ll save the cash and multipurpose the boat shoes. Looks like the price jumped to 109$ What the!?! That’s crazy, it looks to be only for certain sizes, which is weird. Will it look a bit weird if these cognac blucher mocs are worn with chinos? Not at all! That’s a great look. I’m not a fan of mocs that don’t cover the entire foot. It looks too generic prep. That’s why I prefer these. Just nabbed a pair on the Sebago Winter sale for $55! Pretty stoked. I had a pair of Sebago Campsides in the late 80’s and Early 90’s, but unlike the outfit pics above, I never ever wore socks with them, even in the Winter time!